I’m ridiculously excited about my latest fave: a sports bar that checks every. single. box. 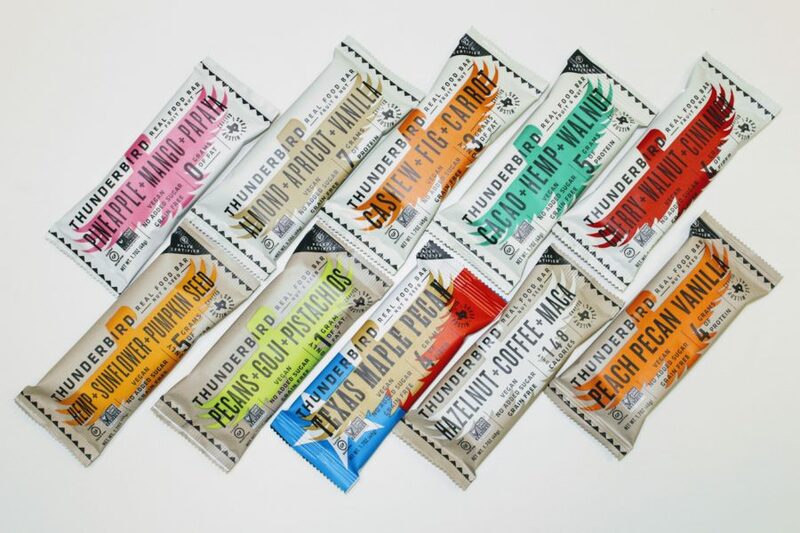 Thunderbird Real Food Bars are vegan, free of added sugars, grains, and GMOs, and locally crafted in Austin, Texas. You can recognize every single nutritious ingredient. Oh, and they’re delicious. My favorites include the Cacao Hemp Walnut which contains dates, hemp seeds, walnuts, coconut shreds, cacao, cacao nibs, chia seeds, mint, and Himalayan sea salt. This with 22 grams of carbs and 5.5 grams of protein – a 4 to 1 carb to protein ratio is ideal for proper recovery after workouts. Thunderbird’s founders are endurance athletes, so that’s likely not a coincidence. I also love the Hazelnut Coffee and Maca flavor, while Sean’s favorite is the Pecans + Goji Berries + Pistachios. Thunderbird bars would make a great stocking stuffer for the athlete in your life. They retail for $29.95 for a case and are available at H-E-B, Sprouts, Whole Foods, or online at thunderbirdbar.com.